If you are looking to minimize tax and insurance costs or meet audit requirements, then asset visibility is critical. Use RedBeam to maintain accurate fixed asset records so you know what you have and where it is. 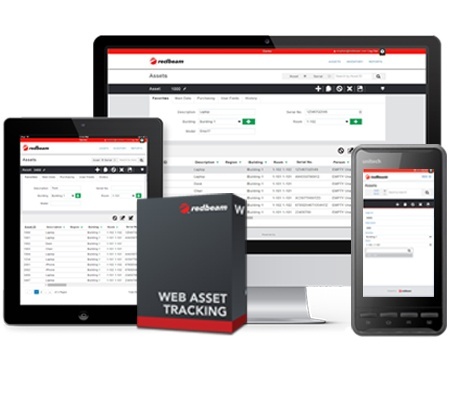 RedBeam Web Asset Tracking integrates best asset tracking practices (bar coding, detailed record keeping, and reporting) in one powerful system, accessible real-time from your desktop and on Windows Mobile 6.5, Android and iOS devices. Planning to use cloud inventory management? There’s nothing to install! Planning to self host? You only have to install the web-based asset tracking application on a single server. Once it’s installed, users can access the system right away and since upgrades are delivered to a single server, there’s never a need to upgrade each client PC. Give your employees the freedom of online inventory control of assets from anywhere and from any device. No matter where they are, your team can stay productive. Online asset tracking extends your ability to receive and manage critical information about your valuable property. For as little as $50 per month, you can manage your organization's valuable property via the cloud based inventory asset tracking software and Windows Mobile 6.5, Android or iOS devices. Alternatively, RedBeam Web Asset Tracking is also available as a traditional software license purchase that runs on your own server. RedBeam Web Asset Tracking provides the flexibility to use barcode labels and/or RFID tags as needed. The Windows Mobile application provides full scanner support, and you can use any bluetooth scanner with your Android or iOS tablet or handheld. In addition, the Windows Mobile application supports RFID scanning on select mobile devices. RedBeam Web Asset Tracking was designed to be simple and easy to use. Whether you're using the cloud inventory management software option or you self host, you can personalize the look and feel of the application to reflect your brand. Easily upload your logo and color scheme. In addition, you can choose which fields to display and what order they’re in using simple drag and drop functionality. The cost of rugged mobile devices can sometimes prevent an organization from purchasing them for everyone who could potentially benefit from their use. With RedBeam, your employees can also work on Android or iOS devices as needed. You don’t have to limit your web inventory software to a few select people, which can make your asset management team more mobile and, in turn, more productive.